Franklin Construction is a fourth-generation family business that was founded over 100-years ago by Francesco Tagliatela. Initially, the company focused on building single-family houses and decades later began large-scale construction projects like schools, fire stations, and libraries. Under the leadership of Francesco’s son, Louis Tagliatela, Sr., the company shifted focus to building and managing apartment communities. After developing a large apartment portfolio in Greater New Haven, Louis built North Haven Health & Racquet and decades later, the Saybrook Point Inn, Marina and Spa. 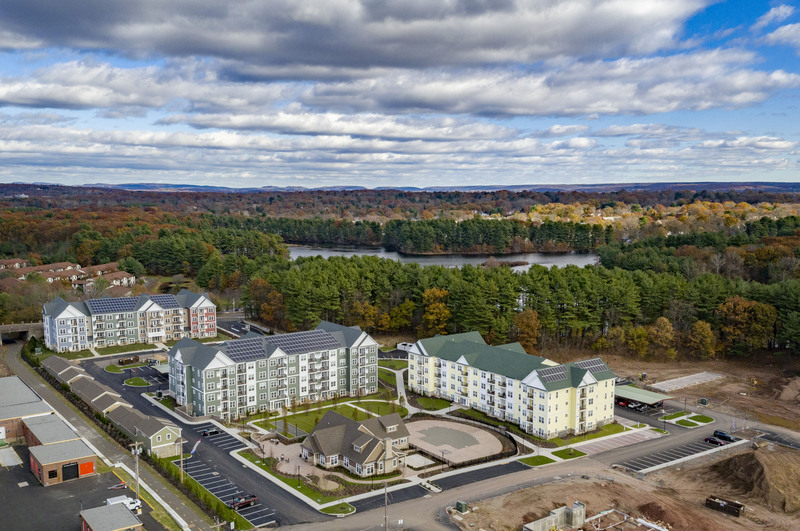 In 2016, Franklin began building Canal Crossing at Whitneyville West, Hamden’s newest luxury apartment community. Franklin is currently headed by Louis Tagliatela Sr.’s children, Louis Jr., Tricia, and Stephen, and includes his granddaughter Lauren, the company’s fourth generation of leadership. Louis F. Tagliatela Jr. is principal of Franklin Communities, an affiliate of Franklin Construction, a family-owned business that was founded by his grandfather in 1917. Franklin Communities owns and operates more than 1,000 apartment units in New Haven County, and Louis supervises all new and major construction projects and initiatives. Under his leadership, Franklin Communities’ portfolio of properties has nearly quadrupled. Louis, along with his brother and sister, was instrumental in the construction and development of Saybrook Point Inn & Spa, a AAA four-diamond facility, and Saybrook Point Marina, which has twice been recognized as the National Marina of the Year, as well as North Haven Health & Racquet, Connecticut’s premier fitness club and gym. Louis’s daughter Lauren, the first in the family to receive an MBA, is the fourth generation to work in the business. The companies owned and operated by Franklin Construction together have earned seven Green Circle Awards from the Connecticut Department of Environmental Protection. In the last several years, Louis oversaw the installation of two solar electric systems that, combined, generate more than 230,000 watts. Louis is currently directing the building of Canal Crossing in Hamden, which will consist of 393 apartments, and the development of the Cape Arundel Cottage Preserve, which will feature 263 seasonal cottages near Kennebunkport, Maine. One of the most respected names in home construction, Louis has been active with the Home Builders Association of New Haven County for nearly 50 years and is a past president. He is a graduate of Georgetown University, where he earned a bachelor’s degree in business administration. He is a director of the Louis F. and Mary A. Tagliatela Foundation, a charitable organization started by his parents that supports children and youth, community development, the environment, health, social and human services, and higher education. Louis and his family have long supported the University of New Haven and Albertus Magnus College. The University of New Haven’s Tagliatela College of Engineering and Albertus Magnus College’s Tagliatela School of Business and Leadership are named in their honor. Louis has served as a trustee of Albertus Magnus College for nine years. The family also supports an endowed scholarship fund and the University’s Lyme Academy College of Fine Arts. For Stephen, hospitality and tourism is in his blood; he was born and raised in a family business and has followed in the family’s footsteps since he was fresh out of college. Initially, it was Stephen’s grandparents, who operated the local Castle Inn in the 1950s and hosted such famous guests as Charlie Chaplin, Howard Hughes and Jimmy Durante that foreshadowed his career before he was born. Later, Stephen’s mother and father bought the infamous Terra Mar Hotel in town, and opened the Saybrook Point Inn, tipping their hat to the legendary Terra Mar by naming the restaurant at the Inn for the old hotel. Today, Stephen, along with his sister Tricia Tagliatela, who oversees the Inn’s decor and ambiance, and brother Louis Jr., who oversees capital projects, now runs Saybrook Point Inn, Marina & Spa. The Inn is Connecticut's first waterfront AAA four diamond inn and restaurant. The award-winning Saybrook Point Marina is the only marina in the state to have the Five-Bell Marina designation and has earned many national marina awards including the National Marina of the Year Award in 2007 by Marina Dock Age magazine. The Saybrook Point Inn has been awarded the Platinum Green Leader rating by the world’s largest travel web-site, Trip Advisor. Committed to safeguarding the environment, Stephen has taken significant steps to embrace green initiatives. Under his direction, Tagliatela companies, including the Saybrook Point Inn, has earned EPA’s coveted Energy Star Award in 2007 and several Green Circle Awards from the Connecticut Department of Environmental and Energy Protection. The DEEP also awarded the Saybrook Point Marina with the state's first Clean Marina designation in 2003. Stephen was first person to receive the Connecticut River Man Award by the Connecticut River Museum because of his stewardship for the protection of the river’s American Heritage River designation. Most recently, he was awarded the Connecticut Tourism Leadership Award by the Connecticut Governors Tourism Council. Stephen is also co-owner of Franklin Construction, LLC, of New Haven, founded in 1917 by his grandfather, Francisco Tagliatela. He is also co-owner of the North Haven Health & Racquet Club, one of the state's largest tennis and fitness facilities. He is a licensed real estate broker and is involved in a variety of real-estate partnerships throughout New England. Stephen recently formed the state’s first-ever Connecticut Tourism Coalition, an alliance of advocates from all sectors of the Connecticut tourism industry to rally for a more reliable source of annual funding, pro-business policy, and stronger public support. In leading the effort, Stephen has been unifying tourism partners under one collective voice in order to help strengthen and bolster the Connecticut economy by generating tax income for the state and jobs for Connecticut residents. Every year, Stephen exposes great numbers of Connecticut visitors to the rich maritime heritage and culture of Connecticut’s shoreline region and lower Connecticut River Valley. Stephen is currently a director of the Louis F. and Mary A. Tagliatela Family Foundation which focuses on healthcare and education in the greater New Haven area. The foundation established an endowed scholarship at the University of New Haven and is a generous benefactor to the University of New Haven's Tagliatela College of Engineering and to Albertus Magnus College’s Tagliatela School of Business. He currently serves on the Board of Directors with the University of New Haven, the Resort Hotel Association, the Connecticut Marine Trade Association, the Connecticut Restaurant Association and is a charter member of the University of New Haven’s Center for Family Business. He is the Chairman of the Board at the Lyme Academy College of Fine Arts. He is also the founder and president of the Connecticut Tourism Coalition. Stephen holds a bachelor's degree in Business Administration from the University of Miami. He was also awarded a Doctorate Degree in Business Administration from the University of New Haven. Stephen and his wife, Viola Maxfield Tagliatela, have two grown children. The couple resides in Old Saybrook while his children are pursuing career opportunities in San Francisco and Los Angeles. When Stephen is not busy with entrepreneurial pursuits, he enjoys traveling, playing tennis, boating, fishing, and relaxing with his wife and their dogs at home. Patricia Tagliatela is a co-owner of Franklin Construction and the managing partner of North Haven Health & Racquet. North Haven Health & Racquet offers more than 75,000 square feet of cardio and weight equipment, 6 tennis courts, 5 racquet courts, a basketball court, track, group fitness room, group exercise and a spinning studio. In addition to these facilities, NHHR also has Fitness on Demand, a private women’s gym, person training, childcare, and tanning. Under Patricia’s leadership, North Haven Health & Racquet was voted Best Indoor Courts by the Advocate from 2006-2012. In 2018, the North Haven Citizen awarded the club with the Best Fitness Center. NHHR also won the Certificate of Excellence by Hamden and Quinnipiac Chamber of Commerce. One of Patricia’s favorite pursuits is creating beautiful spaces. Using her fine eye for detail, Tricia is responsible for the interior design and ambiance at Saybrook Point Inn, Marina & Spa. Tricia is also a director of the Louis F. & Mary A. Tagliatela Family Foundation, which gives over $250,000 in donations annually. Lauren Tagliatela, is delighted to be the 4th active generation in her family's business! She serves as Franklin Communities' Chief Community Officer where she finds creative ways to engage residents, increase resident satisfaction and retention, and directs marketing initiatives for Franklin Communities and Canal Crossing at Whitneyville West. She oversees over 1000 apartments in the New Haven region. Lauren believes it's an honor to be part of a 100-year old family business and hopes to keep her grandfather's legacy alive through providing safe and quality apartments for residents. Lauren recently received her MBA with dual concentrations in Leadership and Marketing from Albertus Magnus College when she graduated in 2017 with honors. Lauren attended Boston University as an undergraduate where she completed a degree in Photojournalism and a minor in Women's Studies. Before working for her family's business, she worked at the New Britain Herald and interned at the New Haven Register, The Boston Herald, The Boston Globe, and the Boston Metro. Her photos have been published all over the world through the Associated Press. Lauren served on the Board of Directors for Boulder Knoll Community Farm for three years. Gardening is one of her favorite ways to relax. When she is not working, Lauren enjoys spending time with her wife Amanda, their twin boys, and their goldendoodle. Bottom Row: Left to Right, Stephen Tagliatela, Louis Tagliatela Jr. Preserving the environment is a top priority of Franklin and its affiliates. Franklin Construction and its affiliated businesses include sustainable practices in their daily operations. Our construction crew recycles 95% of construction waste and only purchases farm-grown sustainable lumber. North Haven Health and Racquet and Saybrook Point Inn use solar voltaic panels to light and power those businesses. The pools at the hotel and Canal Crossing are saltwater, which is healthier for our guests, residents, and our environment. 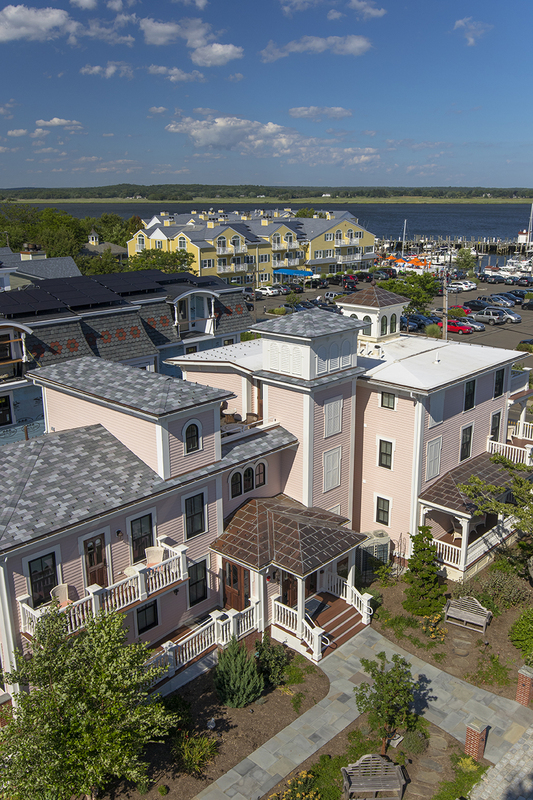 Additionally, Saybrook Point Inn is committed to decreasing its energy and water consumption through motion-sensing thermostats, LED lighting, and washing machines that incorporate a water recycling system. Our Franklin Communities property management team, which manages over 1,000 apartments, recycles batteries, thermostats, and light bulbs. 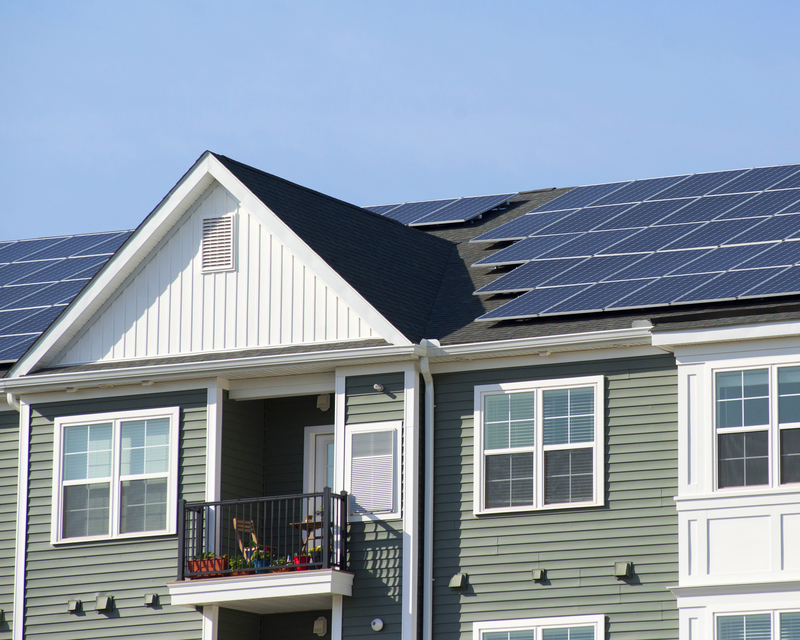 Eighty-five percent of our apartment communities use solar thermal energy, which creates hot water for our residents. Several years ago, our property management team switched to using online applications in order to decrease paper use. 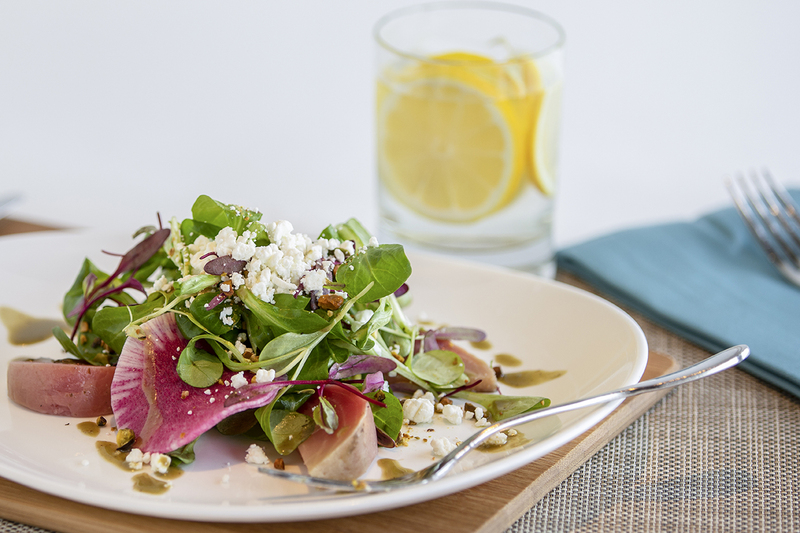 Fresh Salt, the restaurant at Saybrook Point Inn, is part of a Farm-to-Chef Rated Program. As part of our Local Food Commitment, we work closely with local farmers and artisans to craft seasonal menus with fresh ingredients from land and sea. Franklin Construction recycles 95% of its construction waste. 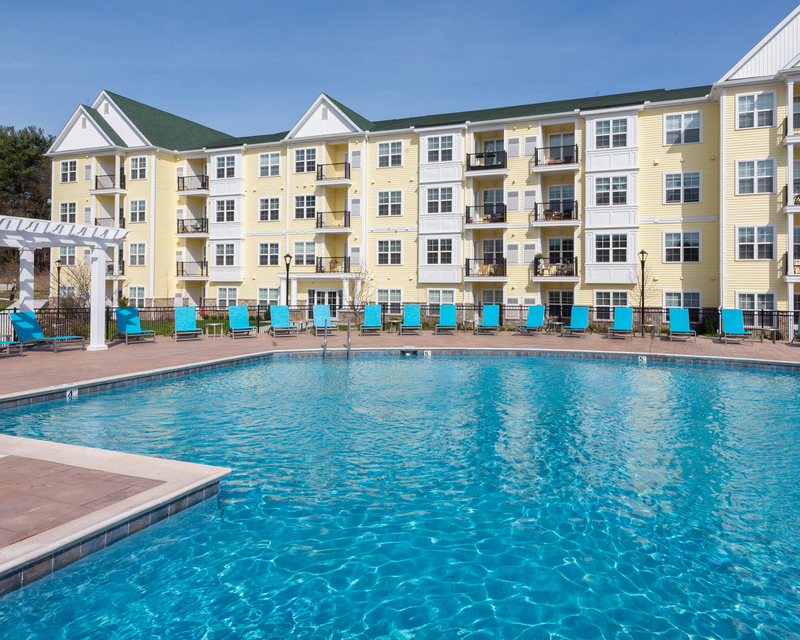 Canal Crossing’s 40,000-gallon salt water pool uses fewer harsh chemicals than a conventional pool. It is gentler on eyes and skin and better for the environment. Saybrook Point Inn received the Green Circle Award from the Connecticut Department of Environmental and Energy Protection and is one of 400 Energy Star Rated properties in the United States. We were the first Green Lodging Certified hotel in Connecticut and a member of the Green Spa Network. 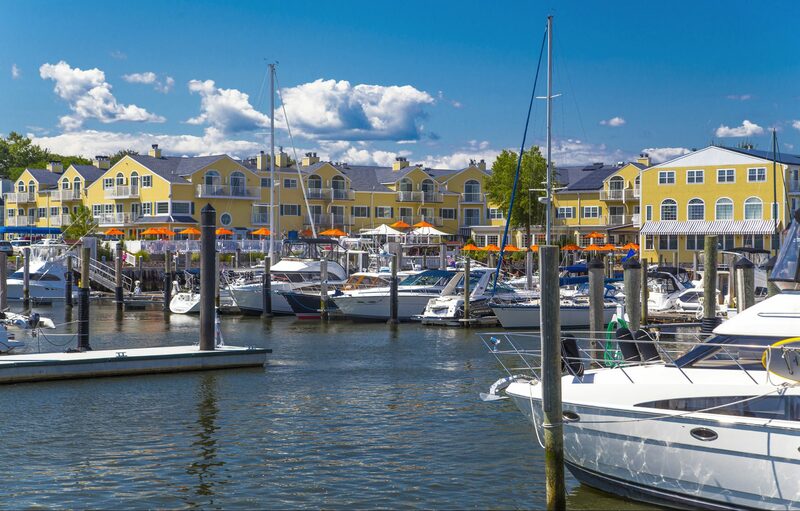 Saybrook Point Inn’s Marina was the first in Connecticut to be honored the Clean Marina Award. The Marina has a boat sewage pump-out station open to the public, and collects and recycles used oil, spent lead-acid batteries, newspapers, cardboard, and bottles and cans from its customers. The Marina also prevents drips and spills at the fuel dock. Canal Crossing has 2,000 feet of solar voltaic panels on each building. These panels provide power to outdoor site lighting and hallway lighting in the buildings. New Haven is where Louis Tagliatela Sr. realized his ambitions and dreams. He often said, “New Haven has been good to me, I want to give back.” The Louis F. and Mary A. Tagliatela Charitable Foundation, which focuses on healthcare, education, and community, has given over 10 million dollars to charities to date.